Home › Auto Newsletter Personalize › CatCushion: Print your Cat's photo on pillow reversible SEQUINS! IMPORTANT PHOTO TIP: Please choose a photo with "facial features" that are clearly visible on your pet (DARK or blurry photos will not show up well). IT'S EASY! Choose your sequin colors, upload a photo, and tell us if you want the photo printed as-is, or if you would prefer we remove the background on your photo! Front: Reversible sequins that "reveal" your HIDDEN KITTY with the swipe of your hand! Great gift for my college bound daughter! 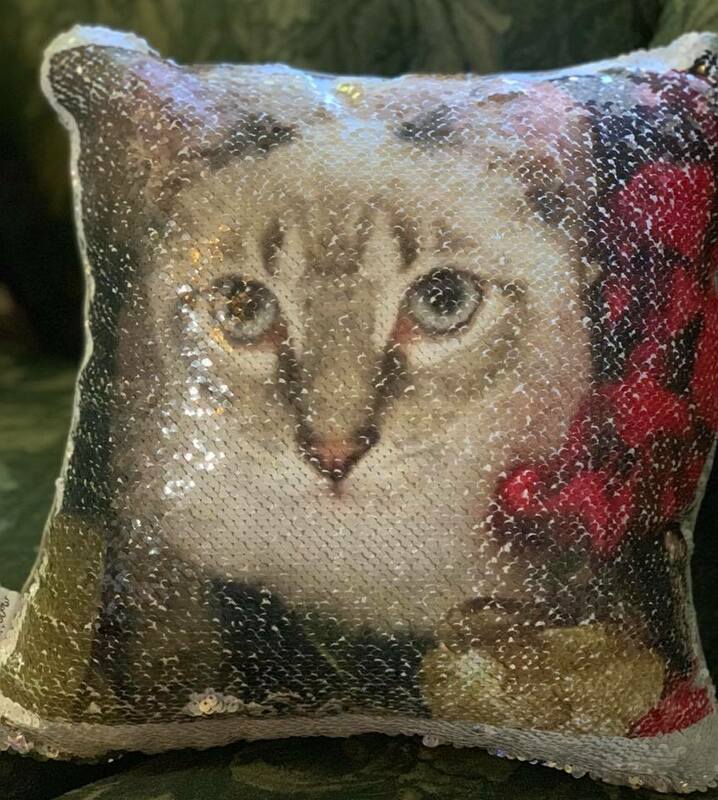 CatCushion: Print your Cat's photo on pillow reversible SEQUINS! I am extremely disappointed with my pillow. The image is too dark. I can barely recognize the dog. I asked specifically if my photo was too dark at the time of ordering. I was told it was ok and I would be contacted if it were too dark when the pillow was made. I understand I agreed to a no refund policy. That is why I asked ahead of time if my photo was good. I was told it was good, but it is not. Poor customer service that relies on their no refund policy so they don’t have to address their customers complaints. Also, they advertise a name on the back of the pillow which is no longer an available option but still advertise a picture of. I recently bought 3 CatCushion reversible Sequin pillows to give as gifts. All 3 people were so happy when pictures of their kitties surprisingly showed up when the sequins were reversed. They absolutely loved their pillows! I will be ordering more!